The subject for this month's Theme Day is 'mailboxes' - the first two are in the medieval village of Roquebrune and the last one, full of unwanted mail, is in Ventimiglia Alta across the border in Italy. Laurie, in South Pasadena, California, has posted exactly the same mailbox as the one above. Isn't that fascinating...the same box all those miles apart. And to see Brattcat's Mail(male)box taken in Gorbio, please click on the link. Le sujet du thème de ce mois est: « Boîtes aux lettres » - Les deux premières se trouvent dans le village médiéval de Roquebrune et la dernière, pleine de courrier indésirable, est en Ventimiglia Alta de l'autre côté de la frontière, en Italie. Cliquez ici, s'il vous plait pour voir comment ce thème d'aujourd'hui a été interprété par d'autres autour du monde entiere. The mailbox in the second photo looks more like a bird house. Very nice mailboxes. I've never seen mailboxes with chimneys. Wonderful and unique. Great shots for this theme day. 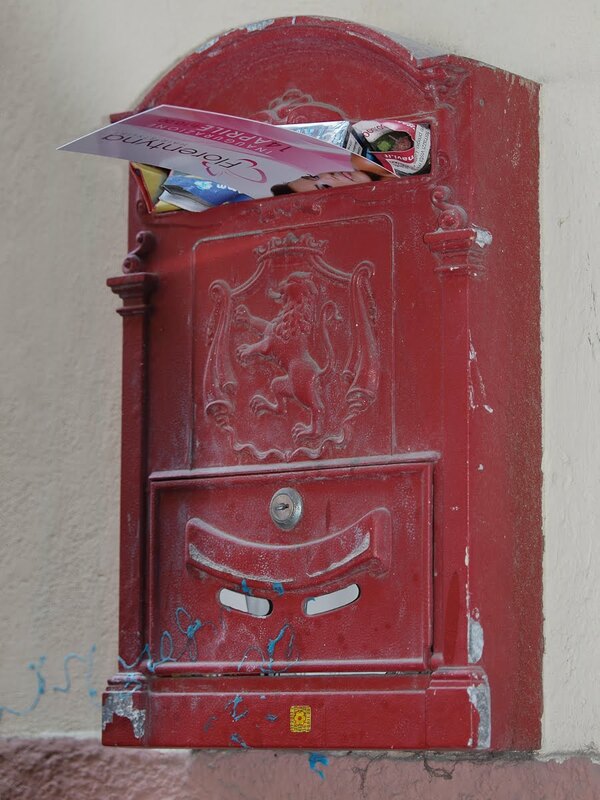 Lovely mailboxes, have a great month Jilly. I love the second one! Horses can often be seen on old fashion boxes. The italian ones are always beautyful! 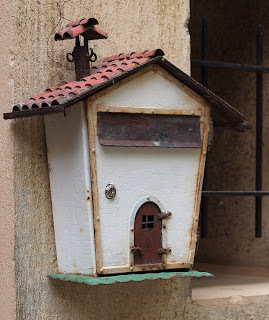 What a pretty mailbox and that's too cool that another just like it was posted, makes the world feel small and cozy! I gasped when I saw that you had commented on my blog. You are like a celebrity to me! Your daily photo blogs are my favorite. I appreciate the variety of your subjects and all of the information that you pass along with your photography. When I read your blogs I feel like I have actually traveled with you. So fun! wow the fact that Laurie posted the same one at the other half of the world is awesome! I love old mailboxes all shapes and sizes and colors you show a nice mix here very good photo's love the red mail box stuffed with letters.. Wonderful catches for the theme, Jilly. I would guess there are many charming mailboxes in your beautiful part of the world as you have so often shown us with windows, entrances, house numbers, walls, byways and such. Love it all. Thank You! Each of these has such distinct character. Wonderful choices, Jilly. And thank you for the link back to Brattleboro (through Gorbio). 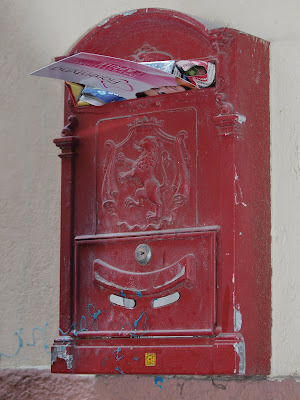 I see that the 'house' theme is quite popular in mailboxes... Yours are excellent! What a great collection of mailboxes! And, I went over to Laurie's site to see the one just like yours. Amazing. Excellent theme day post. I like the Red one. Jilly, this is TOO COOL! Sharing the same mailbox from around the globe. Don't you LOVE City Daily Photo??? 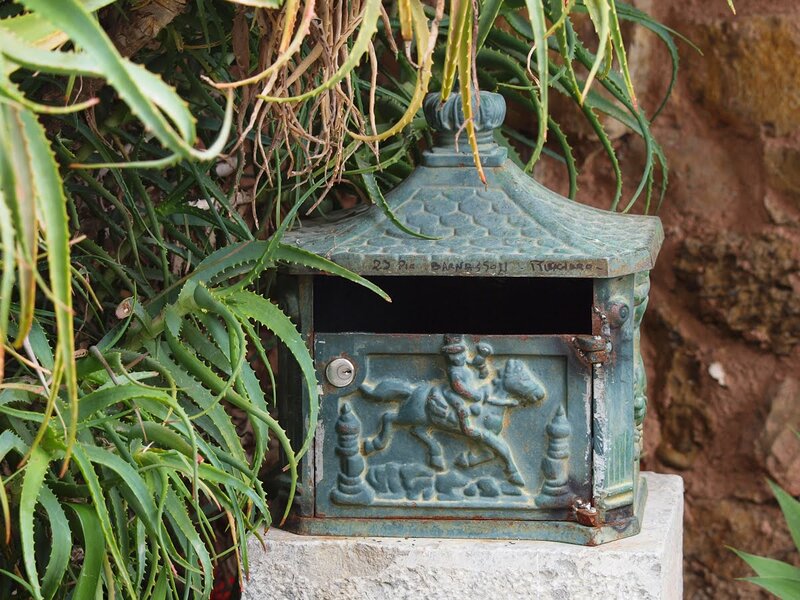 You found some great, unusual mailboxes! Great mailboxes. Each unique in their own way. I would love to live in a place where the first mailbox would not look out of place, Jilly. Wonderful! Jilly, I love all three, but when I saw the first one I thought that it looked like my neighbor's box... I will have to check it out in the daylight! I am crazy for the red one but the setting of that first is beautiful. Truly fascinating that the same mailbox was posted in such different locations. Amazing things we encounter thanks to these blogs!! or French leaving in California..